Our house started out as a wee, two-bedroom, welcome-home-GI house built in 1947. Over the years and through various owners it was expanded a bit, and, amongst the eccentric add-ons is a wee loft over the den, the addition of which happened sometime in the late 1970s. For many years this loft housed a futon mattress, which often served as sleeping space for guests willing and able to climb the steep, ship-like ladder-stairs to the loft. And I admit that it was often -- make that "usually" -- a bit overcrowded with large boxes full of miscellaneous household items. It was also a good nap, reading, and, of course, knitting spot. Best of all, it sports a small, operable skylight so you can invite the breeze in on fine days. It's like having an indoor treehouse. For several months, I've been of a mind to convert this space to a real knitting nest, and Hurricane Katrina has forced my hand. After the first few days of seeing Mom trying to be comfortable on the lumpy sofa-bed in the den, I was inspired to buy a new futon frame, drag the mattress down out of the loft, and set up the futon in a small room downstairs so Mom could be more cozy. This left me with a (mostly) empty loft to clean and de-junkify. So. Now I get to play "Design On A Dime." 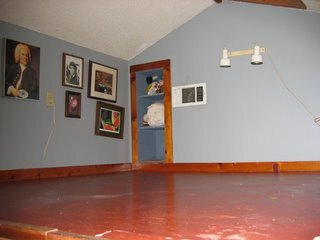 To wit, I plan to transform the former sleeping space and junk storage loft to a cozy knitting and spinning nest. The floor space you see is only 8 feet by 8 feet, and the side wall where the pictures are is only about 40 inches high, so I will not attempt to store much of my stash up here, aside from works-in-progress. One can't exactly stand up in this space (perhaps the Yarn Harlot could) but one certainly can lounge around in it or sit on a spinning stool or in a not-so-big chair. I am inclined to make use of my existing cot-mattress and pillows so I can lounge around like a sultan while Iknit. Perhaps I shall paint the walls. Perhaps not. I will definitely rearrange the pictures on the wall into a more fetching configuration, and perhaps add or delete a few of them. I do plan to stock that little shelving nook (3 feet high, one foot wide) with my favorite knitting books. I also want to lug my spinning wheel and spinning stool up there, and bring up some of my covered baskets full of fleece and spinning supplies. I might even have room for my Navajo loom. The loom is a tad over four feet tall and the space where I want to put the loom is a little under 50 inches tall. It will just exactly fit. I considered scavenging a bit of leftover carpet from a friend in the construction business, but decided that it's easier to clean cat vomit off the painted wood floor. 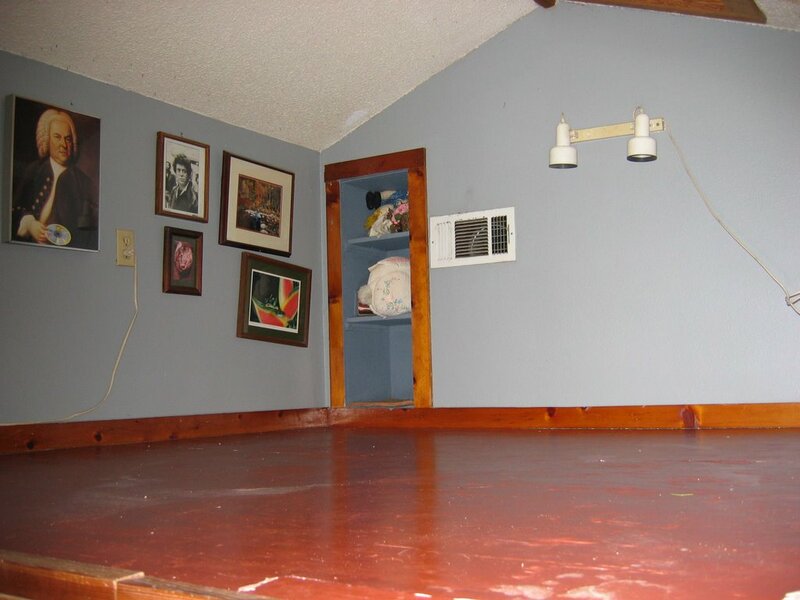 (k.) Felines residing with humans who have installed new carpet at any location in the human dwelling are obliged by this section to deposit hairballs, liquid vomitus and insects and/or grass rejected by the stomach upon new carpeting within twelve hours of installation, and as often as possible thereafter until said carpet is sufficiently stained to match other carpet elsewhere in the human dwelling. So. There you have it, in writing. I might add that it took a considerable bribe of tuna and sardines to obtain that information from a certain feline member of our household, who, for his own safety, shall remain unnamed. So, dear readers -- ideas and suggestions? 2. Several baskets of fleece and spinning supplies. 3. A small cot mattress (28" by 72") to be set along one wall with a convention of pillows upon it. I unfortunately do not have a wise suggestion for that lovely room but I did love the captive feline code. I understand now why my feline owner does certain things she does..
No decorating advice here, either. What a great space, though. I'd have it looking like a little fiber nest in no time. Knitting/yarn stash in one corner. Sewing machine and quilting stuff in another corner. A work table. If I had a spinning wheel it would be there, too. And a lovely, overstuffed chair with foot rest next to the bookshelf. I understand the feline code... smooth surfaces are preferable. My suggestion is to ditch the paintings and put shelves up from floor to ceiling. You can use baskets (plastic or natural) to hold small things and stack larger things directly on the shelves. Put up the kind of shelves that have adjustable brackets. It can be very pretty if you use similar baskets and show all your stash. Also, paint the walls a warm, inviting color to make it even cozier. A nice (yet washable... gotta love cats!) throw rug will warm the floor up. Put your mattress on a bench with storage space underneath (you can build it yourself cheap). A fold down table would probably be useful but not necessary (unless you sew then it's essential). wow, Cathy had some good ideas. I want a loft too! Does the skylight mean that this is fairly comfortable even in hot weather? I'm totally jealous. Is there a window other than the skylight? Either way a nice easy chair by a window or under the skylight, a lamp and soft rug surrrounded by baskets of projects would be cozy. And for good measure add a cat that doesn't throw up! Yaffa blocks or milk crates make good storage places for little money. I would add an electric tea pot so I wouldn't have to carry my tea up and down the steep stairs. Maybe a little dorm fridge for snack, so I'd never have to leave ;). Can any of the Rubbermaid items fit under the cot? Shelves on one wall with baskets would provide storage for a number of items plus a place for more books if it's needed. A good comfy chair and a good reading lamp would be nice too. Is this area totally enclosed or does it have an open wall overlooking the living room? What a great bunch of ideas! I will consider them all. Yes, the space does open over the living room (that's the view I took the photo from, and where the stair-ladder is). Because I took the photo from floor level the space looks a LOT bigger than it is. The floor is slightly less than 8 by 8 feet and the grey part of the wall with the pictures is only 40" high. The back wall is 5 feet high at the peak of the roof. That's where I would like to place the Navajo loom. It would also be under the skylight. To the right, where you can't see, is another low grey wall 40" high. An easy chair would take up about 1/3 of available space, which is why I want to use the cot matterss and pillows. And the cot does not have a frame, so I would either have to build one or just lay it on the floor. Thanks for your input -- this will be a fun project. i agree with the idea of a wall of shelves - you can use them more than you can imagine (i have just added a whole wall of shelves to my new office in my new apt/house. also the idea of the electric kettle for tea. all great ideas! painting the floor might be an idea instead of a rug.